Welcome to Bluff Mountain in Pigeon Forge, Tennessee! If you are a family, a group of friends or just a couple looking to get away, Bluff Mountain is a great destination for your escape. Bluff Mountain provides the incredible views of the Smoky Mountains that you have seen in all the photos. The area is truly a gem in nature. Find challenging and rewarding hiking trails nearby, wildlife that you can not see many other places, and convenient access to all the traditional Pigeon Forge and Gatlinburg attractions. Bluff Mountain offers a variety of rentals. Choose from cabins with different features such as balcony views, hot tubs, jacuzzi's and more! Things to do at Bluff Mountain. Bluff Mountain provides a variety of attractions and things to do on your next Pigeon Forge vacation. The area itself offers one of a kind hiking. Enjoy endless trails and views you will not get anywhere else! After your morning coffee on the balcony head into town and enjoy some of the famous attractions of Pigeon Forge. Ride Go-karts, play putt-putt, or shop for hours at the huge outlet malls. You and your party will find endless adventure when traveling to Bluff Mountain. How to Book a Bluff Mountain Cabin. 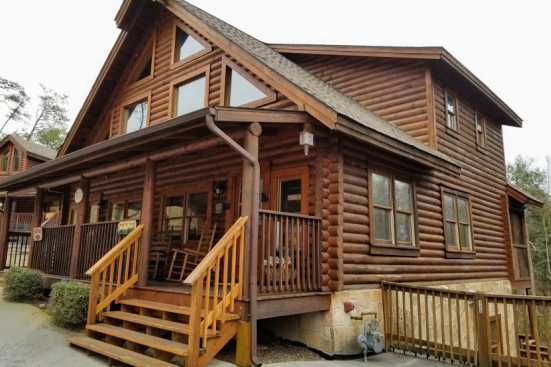 Book your Bluff Mountain cabin rental on SMBYO. SMBYO puts you in direct contact with the property owner or manager. Booking directly with the property owner can save you up to 20% on your vacation.